Plath wrote about the real life events that inspired this story in two letters to Gordon Lameyer written on 22 and 23 June 1954. Plath had recently visited Winthrop because her childhood friend Ruth Freeman's father passed away suddenly. Plath does not however, in either of the letters, make reference to the song. The original letters are held by the Lilly Library in the Lameyer mss. 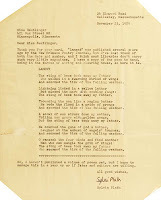 Copies of the letters are in Lameyer's unpublished manuscript "Dear Sylvia." After these letters were written, Plath herself went down to Eastham, Cape Cod, and stayed in the Hidden Acres area where she would later honeymoon, with Ted Hughes, in the summer of 1957. Hidden Acres is so hidden no one seems to know exactly where it was, though Plath tells Lameyer in the second letter that it is off the road to Thumpertown Beach. All links accessed 10 May 2013. 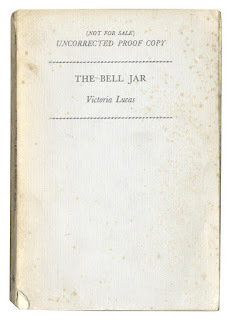 A Bonhams auction today of Books, Maps, Manuscripts and Historical Photographs (Auction 20752) in Knightsbridge, London, included a rare uncorrected proof copy of The Bell Jar by Victoria Lucas (1962) in Lot number 202. The copy sold for higher than the high estimate: £5,000/€5,839/$7,810 (including buyers fees/premiums). The purchaser is now a lucky owner! Congrats! 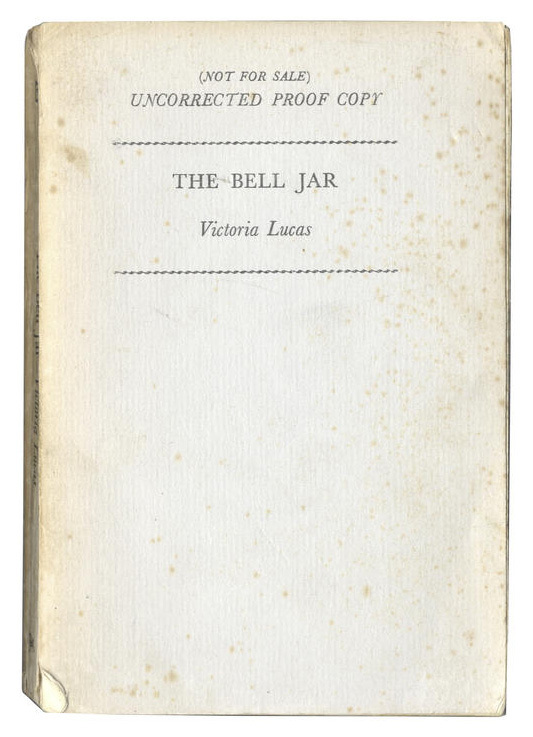 On 19 June 2013, Bonhams (Kensington, London) will auction in lot 202 a rare, uncorrected proof copy of The Bell Jar by Victoria Lucas (Sylvia Plath). Printed in 1962 in an unknown, but limited number of copies, the uncorrected proof of The Bell Jar is the pièce de résistance and also the holy grail of books for a Plath collector. For that matter, one might also want to include the uncorrected proof of The Colossus (1960), too. These books are most desirable, as in possessing more intrinsic--as well as monetary--value as they were printed during Plath's lifetime. "AND HOW ARE YOU FEELING THIS MORNING, MISS LUCAS?" Uncorrected proof of Sylvia Plath's only novel, issued under the pseudonym of Victoria Lucas. There are upwards of more than seventy textual variations between the uncorrected proof (1962), and the final published first edition released by Heinemann in 1963. "These textual differences are the result of edits made either by Plath herself when she reviewed the proof or by the editors as they prepared the final typesetting. This shows that Plath read her proofs of The Bell Jar very carefully and extends our understanding of her involvement in the creative process beyond the composition of the work itself" (Peter K. Steinberg, Textual Variations in The Bell Jar Publications, online resource University of Indiana). For instance in this proof copy on two pages (pp.187/188) the name of the novel's heroine Esther Greenwood remains as "Miss Lucas", the pseudonym under which Plath published the novel. I was quite surprised and honored to have my paper "Textual Variations in The Bell Jar Publications" (Plath Profiles 5, Summer 2012: 104-139) quoted in the catalog and hope that it both helps them sell this copy and encourages someone to purchase it. In addition to the paper on "Textual Variations," I also published a short article in the Spring 2011 issue of Fine Books & Collections entitled "Proof of Plath." 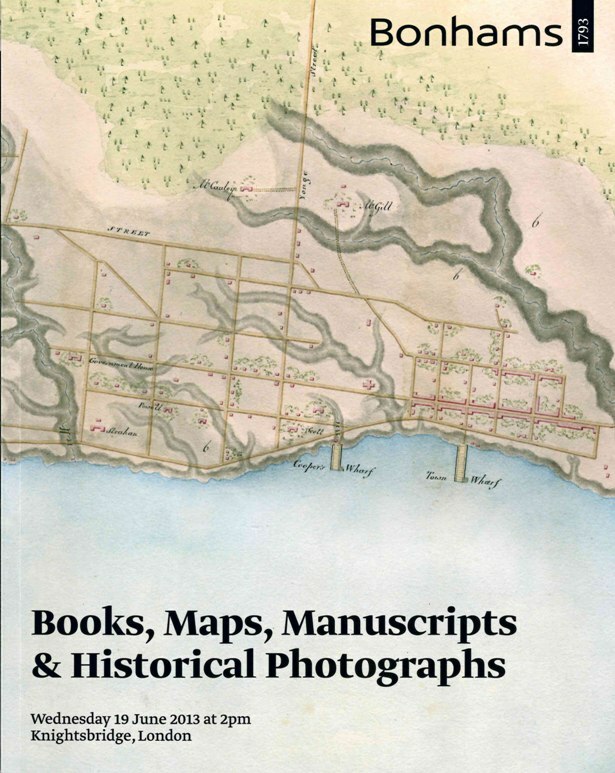 You can still purchase a copy of this issue directly from Fine Books if you are interested in reading it. As you might imagine, I encourage people to do this... And you might as well subscribe to the magazine while you are at it as it is a fantastic publication. Auctions are a wonderful way to acquire Plath materials if you are a collector as the items trend towards the really collectible/rare. There are the odd first Heinemann edition copies of The Bell Jar and The Colossus that have come up. But also even more rare things like a letter from Plath to her mother, her artwork and some childhood creations, and a copy of The Colossus that belonged to her in-laws. The last time that I found an uncorrected proof of The Bell Jar was up for auction was on 15 December 1992, when Sotheby's auctioned an "Advance Proof Copy, without preliminaries and final blank, inscription on first page, some staining, disbound but with backstrip largely present." Even calling this an "Advance Proof Copy" might mean in fact that it was not even an "Uncorrected Proof" : it might have been altogether a different thing. This copy sold to a dealer who in turn sold it off as they do and its whereabouts is not known. The last copy that I know of to come up for sale at all was in May 2010 when London-based bookseller Peter Harrington offered a copy for sale. It was snatched up quickly at a price well above the high estimate of this acution. That copy in particular was more or less "unique", if you will, having promotional/marketing-like text typed on the cover, presumably by someone at Heinemann. This 19 June auction represents the eighth copy of an uncorrected proof known to exist. Three are in rare books libraries (Indiana University, Dartmouth College, and UNC at Chapel Hill); two copies are known to be in private hands;and two are known to exist but their location is unknown. The date of the auction is very timely: 19 June 2013. This is the 60th anniversary of the the execution of Ethel and Julius Rosenberg in New York, which Plath commemorates on the very first page of her novel. 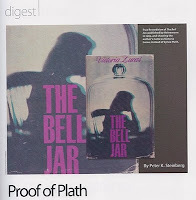 It is also therefore, the 60th anniversary of Plath's own "Bell Jar" summer, when she was guest managing editor for Mademoiselle magazine in New York City. Like drinking, you should bid responsibly. All links accessed 4 June 2013. McMaster University in Hamilton, Ontario, Canada holds more of Eric Walter White's papers (in addition to the papers held at the University of Texas at Austin). There are four different accruals of his papers collected throughout the years. There are Sylvia Plath and Ted Hughes letters in the second accrual, purchased from the bookseller Bertram Rota in 1990. To: 3 TL(car.) 1957-1966. Sylvia Plath has added a postscript note to the ALS from Ted Hughes. Also one TL (car.) addressed to Mrs. Ted Hughes. Photocopy of a typed biographical sketch by Ted Hughes. The correspondence goes from 1957-1966. In one letter from Hughes to White, Plath has added three words in pen to the typed letter. The letter was arguably, in my opinion, typed by Plath. Additionally, Plath added a handwritten postscript to a letter that I roughly date to Monday 3 September 1962. As stated in "These Ghostly Archives 5: Reanimating the Past" this may be the first known example of Plath and Hughes sharing letter-space after the discovery of his affair with Assia Wevill in July of that year. The letter is quite revealing too in that we learn of a new artistic inspiration to Plath: Sidney Nolan. White sent Plath and Hughes some of Nolan's prints and Plath writes that they she was taken in by them. Nolan had a Retrospective exhibition at the Hatton Gallery, University of Newcastle-upon-Tyne, in 1961. It is possible the prints were sent from the book that came out of the exhibit. Additionally, Thames and Hudson published Sidney Nolan by Kenneth Clark and Colin MacInnes in 1961, too. All links accessed on 1 June 2013. On 13 February 2011, Bonhams held an auction and two Sylvia Plath items were up for sale. 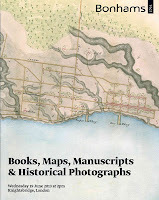 I wrote about it on this blog; but in addition, the lot archives are available and here (Lot 2212). 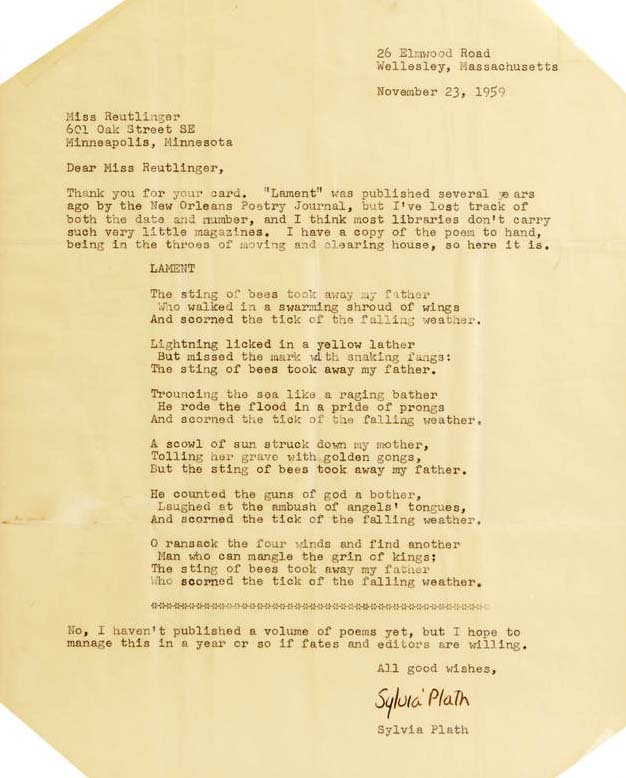 The first lot, 2211, was a letter from Plath to a Miss Reutlinger and failed to sell. Late that year, on 22 June, Bonhams relisted the letter, drastically lowering the estimates...but it still failed to sell that day in Lot 1318. (I wrote about it here, too, because I try to be comprehensive. One thing I love about these auctions is that they provide really good quality images online (and presumably in the printed catalog for the auction, too). Anyway, this is a follow-up post to say that the letter has finally sold... in October 2012! Better to find out later than never... RR Auction in New Hampshire successfully sold the letter for $4,915.20. Not sure where the letter ended up (hopefully an archive), but that's a fair price for sure.